When you think of all the family gatherings during holidays such as Easter, Thanksgiving, and Christmas, one room that stands out from all the others when we talk about these gatherings is the kitchen. As most homeowners here in the Valley will tell you, the kitchen is the most used room in the house, the family’s favorite place to gather, and one of the first rooms homeowners would love to remodel. At Valcon General, in addition to your North Scottsdale dream kitchen being stylish, it needs to be functional as well, sort of like a well-oiled machine. We also understand that when you start out looking at remodeling your kitchen with all the possibilities there are out there today, it can cause quite a lot of stress in choosing the right kitchen for your particular family’s needs. After your Scottsdale custom cabinets have been selected, we will start to look at what type of countertop that will not only enhance your cabinets but the overall look of your home. There is such a wide selection of styles to choose from whether you want granite, marble, synthetic stone, or tile countertops, and Valcon General can also design the perfect backsplash that will match both the countertops and the custom cabinets. Our next step is taking a look at what style of flooring will work best for your particular home. As you can imagine, there are many choices of flooring, and Valcon General will guide you through this process keeping in mind what will not only match and enhance your kitchen, but keeping your budget on track. In addition to these first three big remodel items, we will also help you plan exactly which faucets will best fit your house, find you the right appliances to fit your cooking preferences, as well as helping you choose the right color of paint to bring the kitchen together. We go over each item to ensure our customer receives the kitchen design they wanted. At Valcon General, when it comes to your Cave Creek kitchen remodel, we understand just what steps need to be taken, and we pride ourselves on delivering superior quality products and workmanship each and every time! At Valcon General, we only use professional sub-contractors with years of experience that are fully licensed and insured with a reputation of only using first-rate materials. We want your kitchen remodeling project to have that unique one-of-a-kind feel to it. 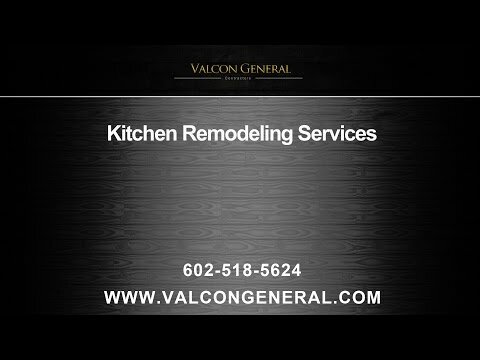 Valcon General has been doing kitchen remodel projects in the Valley for over ten years with a stellar reputation for integrity, evidenced by the fact that so many of our kitchen remodeling projects are from very satisfied former clients. We would be honored to be your contractor for your kitchen remodel and look forward to working with you on the kitchen of your dreams.